The majestic sage grouse once ruled the expansive, open landscapes of the West—but over the past century, their numbers have drastically declined as they've lost their habitat to booming oil, gas, and other development. But for the second year in a row, the House of Representatives has added a provision to the National Defense Authorization Act that would block critical sage grouse protections—even though defense officials from all three military branches have made it clear they see no issues with sage grouse conservation. Help protect wildlife: Tell your Senators to oppose any attempts to block crucial sage grouse conservation. 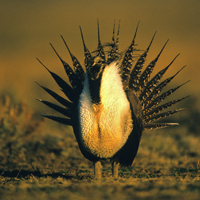 Please oppose any attempts to block the conservation of the greater sage-grouse and the sagebrush ecosystem. The House's proposed language undermining sage grouse conservation would undo critical work to protect this iconic rangeland species, along with more than 350 other species that depend on the same sagebrush habitat. Defense officials from all three military branches have made it clear that federal efforts to conserve the sage grouse habitat does not hinder military operations or training in the area. They do not anticipate problems, and can get exemptions for national security reasons anyway. As a result, this attack has no merit and will only put an already threatened species at greater risk. Please stand against this and any other attacks on wildlife conservation.